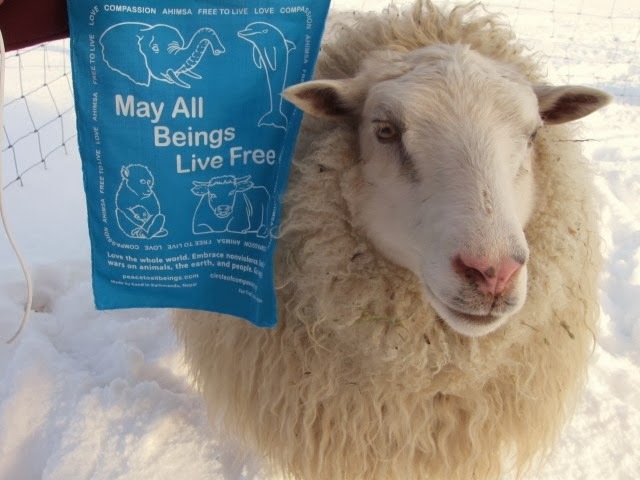 I just received this stunningly beautiful photo by Susan Eakins of this lovely lamb standing next to her prayer flag. This lamb lives at New Dawn Montana Farm Animal Sanctuary. She just seems to me to be the embodiment of the peace that is coming for all beings everywhere. Thank you Susan for this symbol of hope for us all. May this new year of 2014 bring the world closer than it has ever been to peace and freedom for all beings. I watched the images of the dolphins on TV, I think of the rabbits tortured for our clothing, I remember the forests we burn. I feel very sad. Peace to all being would be a blessing.